This month we are profiling Michael Kehs, a turner who applies the aesthetics of stonemasonry and the natural beauty of caves to his work in wood. Talking to Michael you quickly learn that there are practical, creative and aesthetic elements to woodturning that he loves. Among the practical, speed is first. Power tools and how fast they allow him to work is a regular theme in the conversation, as is the creative process. Michael tells me of the pleasure he gets from translating his ideas into physical form, finding solutions to the practical restrictions imposed by wood and designing his carvings to fit a turned form. 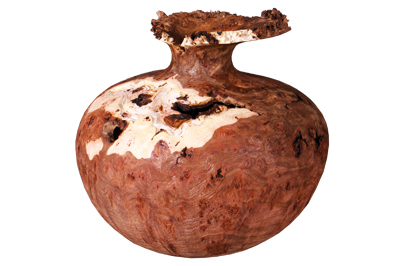 Although sometimes the wood wins out with a beautiful burl later revealing a hollow space; a rough-turned piece cracking as it dries... What is striking in Michael's work is the great range in the forms he turns to express different subject matter. Some of his pieces give a real sense of solidity and weight; others are light and airy, existing as much for the wood that has been taken away as the wood that is left. 'Twilight Flight' and 'Entrance Inhabitants' are beautiful examples of this delicate art. Very little of the original vase shapes are left intact and the connections between his carved forms are minimal. At the opposite end of the spectrum is the dense, dark texturing of his 'Cave Texture' series. Born and raised in rural Bucks county, Pennsylvania, Michael began his professional career as a stonemason, though time spent in his father's workshop during his early years sparked an interest in woodworking that lasts to this day. His life in wood began with carving. He worked his first carvings when he was around 10 years old and his mother, seeing his delight in finishing a piece, went on to find a local woodcarving club for him to attend. After 28 years of stone masonry, he left to pursue his dream of working wood full-time, but he applies the lessons he learnt about looking for balance in the whole piece to all his carving and turning. A former school teacher once commented on Michael's ability to meet people on their own level, and encouraged him to apply this skill through teaching. Michael started his woodturning career following this path, and has taught and demonstrated throughout the United States since the late 1990s. His classes and demonstrations are well attended and in demand. He tells me that creating the space and opportunity for his students to brave their creative side is what really pleases him. Now a respected teacher, he has written for the American Woodturner, the Journal of the American Association of Woodturners, and Woodcraft magazine. 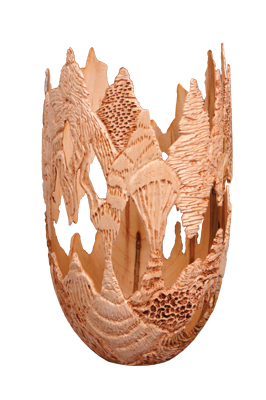 Active in both local and national turning and carving clubs, he also demonstrates and teaches both woodturning and woodcarving in his studio. Making birdhouses with his father laid the foundations for Michael's lifelong love of working with wood: "The smell of cutting walnut (Juglans regia) still takes me back to that wonderful time," he explains. 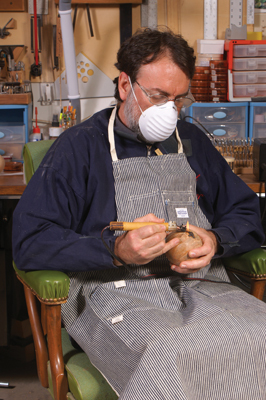 He began with hand-carving techniques and moved on to using power tools, as they allowed him to carve much faster. Michael came to professional woodturning through the challenge presented by a client. He tells me: "In 1986 I was working on a commissioned piece, carving dragons on the top of a backgammon board. The customer wanted this piece to have a turned pedestal. I had done a few turnings back in the late 1970s but nothing serious and nothing long-term," he continues. The pleasure of this challenge, successfully met, inspired and encouraged him to explore turning further. 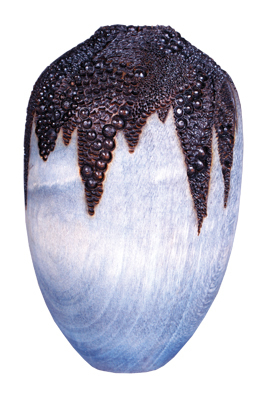 Michael has exhibited in several shows across the United States, including Challenge V: International Lathe-Turned Objects and the National Speleological Society's Fine Art Salon. 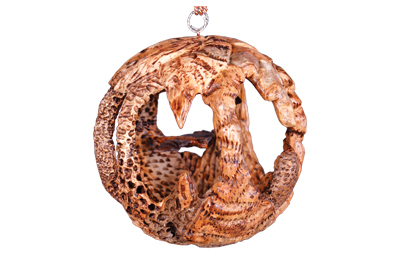 He has a piece held in the permanent collection of The Center for Art in Wood - Woodturning Center - in Philadelphia and had the honour of turning an ornament for the White House in 1993. Designated the 'year of the craft' by Presidential proclamation, 1993 was a year-long celebration of handmade craft in America, which President Bill Clinton celebrated by assembling a collection of 75 contemporary American pieces. His pieces are also included in many private collections. As a turner/carver Michael has won many awards in art and craft shows - including several Best of Show - and as a judge he has awarded many honours. Michael's inspiration - the natural world - is writ loud in his work. 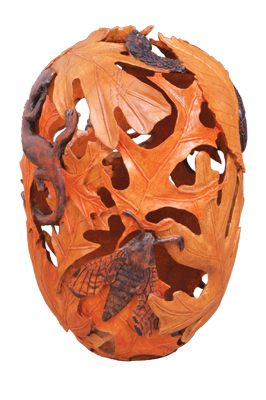 He has enjoyed the outdoors for many years and has used the shapes and designs of nature as ideas to incorporate into his carvings. While this has remained constant throughout his woodworking life, in recent years it has come from a more specific source - the world of caves. Speleology has become an avid pursuit for Michael, and one that spills into his work. He loves to explore the caves in the Pennsylvania hills. â€œOn my caving trips I'll see many fantastical things. There are the usual stalagmites and stalactites, but we may see things like a dogtooth spar or something that looks like popcorn all over the walls of a cave, gypsum flowers poking out of the rock.â€ Many of his pieces are carved, textured or inlaid with embellishments resembling these growths, and this leads to a surprising difference in appearance and style. Bat and salamander designs also feature heavily in his work. He stresses that one should carve what one knows. As he explains: "The things I see while underground are not available to the average person to see. You must be adventurous and unafraid to get muddy to see these sights. Caving can be scary and strenuous but the payoff is worth the effort." You could say that Michael's style has become more comprehensive as he weaves turning and carving in a single form. Undoubtedly, it has become more artistic. "When I first started turning I made useful things: table legs, lamps, bowls, etc. Turning was very intoxicating and I stopped carving for about four years to satisfy my desire to create turned objects. I still do these but now, instead of dropping one form of expression for another, I carve on my turnings, which opens up a whole new avenue for me." For Michael, turning and carving support each other and form follows subject. He tells me: "My turnings are basically canvases for my carvings. The shape of the turning is dependent on the subject of the carving. I like carving bats on vertical surfaces and salamanders on horizontal surfaces." You can see from these pieces that he also utilises grain and burr, often incorporating these into his designs. Negative space is another characteristic feature of his turning. His 'Twilight Flight' is a supreme example of this. The shadows and light created by the negative space give a real sense of the eerie space of a cave. What I really like about this piece is that it does this whether in a dark room or light, but with totally different effect. 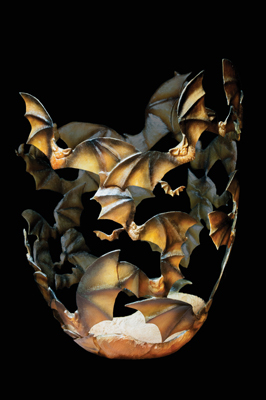 In a dark space it suggests the torch-lit depths of a cave; in light, the flight of bats through a cave mouth. Michael himself points to his varied use of texture in many pieces. Among the many effects he applies are sandblasted texture, carved texture, burn texture, and hammer texture. Michael's workshop is about 25 x 40ft, with a ceiling that is 10ft high. It is filled with lathes and tools. The lathes - he has five - he needs for the classes he holds there, but the tools are for himself: "I believe I'm like most woodworkers. I love my tools." He has collections not only for turning and carving, but also for cabinetmaking. In keeping with his love of speed, it is his power carving tools that he could not do without: "I would need to replace them as soon as possible." 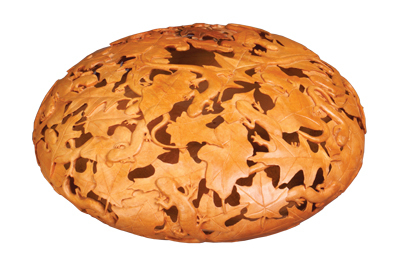 For Michael, a turned and carved piece can take anywhere from 40 hours to 200 hours, not including the designing time. He tells me that the biggest part of carving is doing the research on the desired shapes. As to a typical day in his workshop? "This a tough question. Every day is a new slate." He usually arrives by 8am. He tunes his internet radio and gets started. Apart from that routine, nothing stays the same. "Some days I have students in the afternoon or evening. You're likely to see a client stopping in to pick up a finished job or to discuss a future work." As most of his projects take a lot of time, he usually has a few on the go at once, but whatever he embarks upon, his ethos is to "get the job done". He believes in having a plan and sticking with it, unless he comes up with a better one. "There is no benefit in discounting a new idea just to stick to a plan. The new direction might be better." When I asked how he promoted his work, he replied that this was one area that could do with some improvement. Currently, he uses the internet, word of mouth and targeted emails. When I ask Michael about his aims and aspirations, he tells me that he plans to expand his business to produce small runs of useful household items, including cutting boards, utensils and shelves. But he will hire someone for this work while he explores his artistic bent. "I feel connected to life and fulfilled when I'm expressing myself through nature. I will be trying my hand at sculpture in the not-too-distant future." He tells me he has a great respect for Sam Maloof and George Nakashima, among other woodworkers, and hopes himself to become a respected woodworker/woodturner in this way. "The high point of my career has got to be the acceptance of my abilities as an instructor and artist by the turning field." As to the low point, he can't think of one. "I'm sure there was something, but I always look to the future and the low times don't leave a mark." One of his pieces, worth a few hundred dollars, was stolen from a show but, in true positive form, Michael "figured that meant the piece was just that good," he explains. 3. The creative process â€“ when it works perfectly, it is just wonderful!